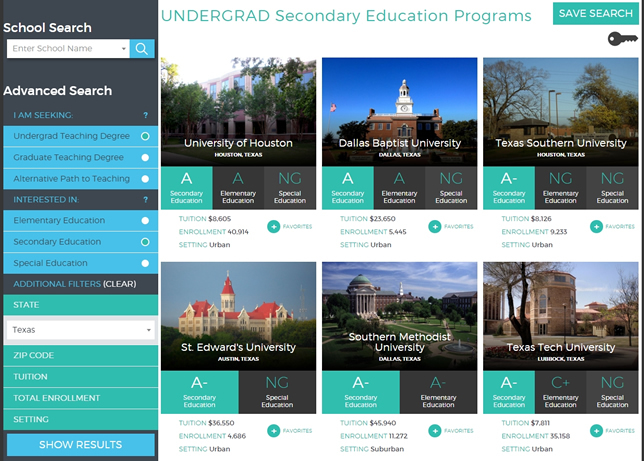 In the state of Texas the University of Houston got an A for its elementary and secondary education programs, while Texas A&M received a C+ for secondary education, and Wayland Baptist University earned Fs across the board. These grades, along with 2,300 others, were issued on a new online resource that ranks the teacher education programs run by American colleges and universities. The site was developed by the National Council on Teacher Quality (NCTQ), a research and policy organization focused on improving the teaching profession. The launch occurred at the same time YouthTruth issued a finding that 32 percent of high school students don't feel positively about their teachers' content knowledge of the subject matter being taught. The results came from a survey of almost 130,000 high school students across the country. YouthTruth, part of the Center for Effective Philanthropy, surveys students in grades 3-12 to understand what works and doesn't work for them in their own schools. The survey also found that two-thirds of students (67 percent) don't feel challenged by their teachers or coursework and four in 10 (41 percent) don't consider their homework useful in helping them understand the subject. The goal of NCTQ's Path To Teach, is to help those interested in getting into the field to identify the best schools for obtaining a teacher education at both the undergraduate and graduate levels. NCTQ has previously issued rankings of teacher prep programs, but without the level of detail provided in the new resource. Rigor, which compares the number of teacher candidates who graduate with honors against the number of all students in the institution doing the same. Snapshots for each institution also provide data on tuition and financial aid, school size, admission statistics, type of school setting, the size of and admission requirements for the teacher preparation program and its diversity. NCTQ said that the information for determining the grades come from a myriad of sources: admissions standards posted online, course catalogs, course materials, required textbooks, class schedules, student assignments, graduate and employer surveys, student teaching handbooks, correspondence with school districts and state laws. The organization requests the materials from the institution or collects it from students and faculty. A team of 50 analysts examines the content, and then two of them perform independent reviews to decide on scores for a given standard. Where they disagree, a third analyst reviews the analysis and makes a final decision. The report cards are available on the Path To Teach site.